Christmas and New Year’s is a traditional time for people from all around the globe to sum up their yearly progress. What people have accomplished, what they have faced and learned – you see this all over social media this time of year. At MinerGate we didn’t want to feel left out so here we are: we have counted, collected and analyzed pertinent information about our mining pools’ activities during 2018 and are pleased to share it with you. Stable out the gate, 2018 presented us with several surprises. Looking back this year was marked by a number of forks and network upgrades, an emergence of PoS-based projects, and the rises and falls of many coins. Even the Cryptocurrency King, Bitcoin, gave all of us a surprise by the end of the year. Despite all the fluctuations and issues in the blockchain world, the MinerGate team stayed strong and continued to look after its users with software updates and flexible reactions to market changes. Let’s have a look at MinerGate’s stats of the year. There were more than 150,000 blocks found in all supported blockchains. Counting the average block size of each network, that is more than 1.8 Petabytes of information processed through our mining pools. All these numbers were made possible only with your assistance. 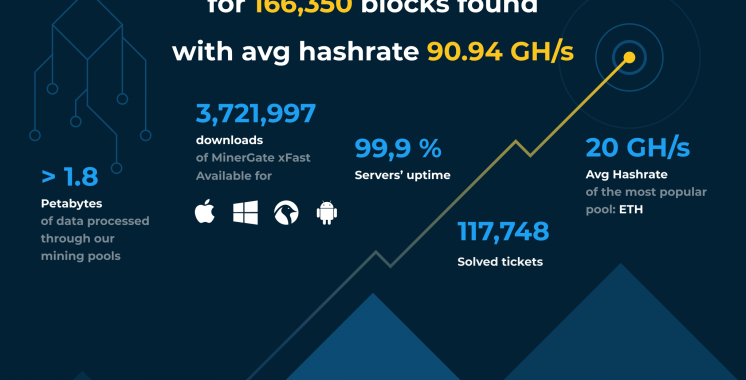 MinerGate’s average hashrate in 2018 was more than 90 GH/s for all supported cryptocurrencies. Based on the block reward of each blockchain, our users mined almost 13,000,000 various crypto coins. Furthermore, In April MinerGate supported one of the most significant hardforks – the Monero upgrade – and listed both the renewed Monero and one of its forks, Monero Original. In all, MinerGate created 4 new mining pools this year: the CryptoNight ASIC pool for merged mining; the Monero Original mining pool, which was replaced by the Monero-Classic pool after the latest upgrade in XMC blockchain; and, of course, the milestone Bitcoin Mining Pool. For the MinerGate team, 2018 has been a challenging, yet successful year. With an average server uptime of 99,9%, we have provided our users with one of the most stable working services on the market. And it was proven by your support: the total amount of downloads of MinerGate’s software reached almost 3,800,000. Moreover, our Support team processed and successfully resolved over 100,000 tickets from our users, including test reports of the new MinerGate xFast Miner. The post MinerGate’s year results appeared first on Crypto Mining Blog.